While not unknown to the physicist, the fundamental role of quantum mechanical tunneling effects in chemistry has long been neglected at large. Whereas tunneling has traditionally been viewed as an exotic phenomenon that may speed up otherwise slow reactions under conditions that have little to no chemical relevance, the advent of hydroxymethylene (HCOH) has demonstrated that tunneling indeed does not only influence, but may even dominate chemical reactivity entirely. Following the pioneering studies on HCOH, a sizeable number of examples clearly showing the critical importance of the tunneling effect in chemistry has emerged, ranging from other members of the hydroxycarbene family to carboxylic acids and leading to the introduction of the novel concept of Tunneling Control. Building upon our early results, we are aiming to explore the importance of tunneling in biologically important compounds as well as to elucidate the electronic factors that govern it. We report the gas-phase preparation of cyanohydroxycarbene by high-vacuum flash pyrolysis of ethyl 2-cyano-2-oxoacetate and subsequent trapping of the pyrolysate in an inert argon matrix at 3 K. After irradiation of the matrix with green light for a few seconds singlet trans-cyanohydroxycarbene rearranges to its cis-conformer. Prolonged irradiation leads to the formation of cyanoformaldehyde and isomeric isocyanoformaldehyde. Cis- and trans-cyanohydroxycarbene were characterized by matching matrix IR and UV/Vis spectroscopic data with ab initio coupled cluster and TD-DFT computations. 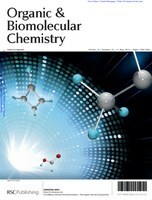 Trans-cyanohydroxycarbene undergoes a conformer-specific [1,2]H-tunnelling reaction through a 33.3 kcal mol−1 barrier (the highest penetrated barrier of all H-tunnelling reactions observed to date) to cyanoformaldehyde with a half-life of 23.5 ± 0.5 d; this is the longest half-life reported for an H-tunnelling process to date. During the tunnelling reaction the cis-conformer remains unchanged over the same period of time and the Curtin–Hammett principle does not apply. NIR irradiation of the O–H stretching overtone does not enhance the tunnelling rate via vibrational activation. Push–pull stabilisation of hydroxycarbenes through σ- and π-withdrawing groups therefore is even more stabilizing than push–push substitution. Highlight: a) Noted as very important paper (top 5% of all Angewandte publications), b) Frontispiece of communications of this issue. Although N‐heterocyclic carbenes have been well‐studied, the simplest aminocarbene, aminomethylene H−C̈−NH2, has not been spectroscopically identified to date. Herein we report the gas‐phase preparation of aminomethylene by high‐vacuum flash pyrolysis of cyclopropylamine and subsequent trapping of the pyrolysate in an inert argon matrix at 12 K. Aminomethylene was characterized by matching matrix IR and UV/Vis spectroscopic data with ab initio coupled cluster computations. After UV irradiation of the matrix aminomethylene rearranges to its isomer methanimine (formaldimine) H2C=NH. Based on our experimental results and computations aminomethylene has a singlet ground state with a reaction barrier of almost 46 kcal mol−1 to methanimine so that H‐tunneling is excluded. Disentangling internal and external effects is a key requirement for understanding conformational tunneling processes. Here we report the s-trans/s-cis tunneling rotamerization of carbonic acid monomethyl ester (1) under matrix isolation conditions and make comparisons to its parent carbonic acid (3). The observed tunneling rate of 1 is temperature-independent in the 3–20 K range and accelerates when using argon instead of neon as the matrix material. The methyl group increases the effective half life (τeff) of the energetically disfavored s-trans-conformer from 3–5 h for 3 to 11–13 h for 1. Methyl group deuteration slows the rotamerization further (τeff ≈ 35 h). CCSD(T)/cc-pVQZ//MP2/aug-cc-pVTZ computations of the tunneling probability suggest that the rate should be almost unaffected by methyl substitution or its deuteration. Thus the observed relative rates are puzzling, and they disagree with previous explanations involving fast vibrational relaxation after the tunneling event facilitated by the alkyl rotor. Although frequently employed, heavy atom kinetic isotope effects (KIE) have not been reported for quantum mechanical tunneling reactions. Here we examine the secondary KIE through 13C-substitution of the carbene atom in methylhydroxycarbene (H3C–C̈–OH) in its [1,2]H-tunneling shift reaction to acetaldehyde (H3C–CHO). Our study employs matrix-isolation IR spectroscopy in various inert gases and quantum chemical computations. Depending on the choice of the matrix host gas, the KIE varies within a range of 1.0 in xenon to 1.4 in neon. A KIE of 1.1 was computed using the Wentzel−Kramers−Brillouin (WKB) CVT/SCT, and instanton approaches for the gas phase at the B3LYP/cc-pVTZ level of theory. Computations with explicit consideration of the noble gas environment indicate that the surrounding atoms influence the tunneling reaction barrier height and width. The tunneling half-lives computed with the WKB approach are in good agreement with the experimental results in the different noble gases. This Perspective describes the emergence of tunneling control as a new reactivity paradigm in chemistry. The term denotes a tunneling reaction that passes through a high but narrow potential energy barrier, leading to formation of a product that would be disfavored if the reaction proceeded by passage over kinetic barriers rather than through them. This reactivity paradigm should be considered along with thermodynamic and kinetic control as a factor that can determine which of two or more possible products is likely to be the one obtained. Tunneling control is a concept that can provide a deep and detailed understanding of a variety of reactions that undergo facile (and possibly unrecognized) tunneling. Formation of a Tunneling Product in the Photo-Rearrangement of o-Nitrobenzaldehyde. The photochemical rearrangement of o-nitrobenzaldehyde to o-nitrosobenzoic acid, first reported in 1901, has been shown to proceed via a distinct ketene intermediate. In the course of matrix isolation experiments in various host materials at temperatures as low as 3 K, the ketene was re-investigated in its electronic and vibrational ground states. It was shown that hitherto unreported H-tunneling dominates its reactivity, with half-lives of a few minutes. Unexpectedly, the tunneling product is different from o-nitrosobenzoic acid formed in the photoprocess: Once prepared by irradiation, the ketene spontaneously rearranges to an isoxazolone via an intriguing mechanism initiated by H-tunneling. CCSD(T)/cc-pVTZ computations reveal that this isoxazolone is neither thermodynamically nor kinetically favored under the experimental conditions, and that formation of this unique tunneling product constitutes a remarkable and new example of tunneling control. Using the tunneling-controlled reactivity of cyclopropylmethylcarbene, we demonstrate the viability of isotope-controlled selectivity (ICS), a novel control element of chemical reactivity where a molecular system with two conceivable products of tunneling exclusively produces one or the other, depending only on isotopic composition. Our multidimensional small-curvature tunneling (SCT) computations indicate that, under cryogenic conditions, 1-methoxycyclopropylmethylcarbene shows rapid H-migration to 1-methoxy-1-vinylcyclopropane, whereas deuterium-substituted 1-methoxycyclopropyl-d3-methylcarbene undergoes ring expansion to 1-d3-methylcyclobutene. This predicted change in reactivity constitutes the first example of a kinetic isotope effect that discriminates between the formation of two products. Conformational control of organic reactions is at the heart of the biomolecular sciences. To achieve a particular reactivity, one of many conformers may be selected, for instance, by a (bio)catalyst, as the geometrically most suited and appropriately reactive species. The equilibration of energetically close-lying conformers is typically assumed to be facile and less energetically taxing than the reaction under consideration itself: this is termed the ‘Curtin–Hammett principle’. Here, we show that the trans conformer of trifluoromethylhydroxycarbene preferentially rearranges through a facile quantum-mechanical hydrogen tunnelling pathway, while its cis conformer is entirely unreactive. Hence, this presents the first example of a conformer-specific hydrogen tunnelling reaction. The Curtin–Hammett principle is not applicable, due to the high barrier between the two conformers. The cis,trans-conformer of carbonic acid (H2CO3), generated by near-infrared radiation, undergoes an unreported quantum mechanical tunnelling rotamerization with half-lives in cryogenic matrices of 4–20 h, depending on temperature and host material. First-principles quantum chemistry at high levels of theory gives a tunnelling half-life of about 1 h, quite near those measured for the fastest rotamerizations. Matrix-isolation experiments near 3 K and state-of-the-art quantum chemical computations demonstrate that oxalic acid [1, (COOH)2] exhibits a sequential quantum mechanical tunneling phenomenon not previously observed. Intensities of numerous infrared (IR) bands were used to monitor the temporal evolution of the lowest-energy O–H rotamers (1cTc, 1cTt, 1tTt) of oxalic acid for up to 19 days following near-infrared irradiation of the matrix. The relative energies of these rotamers are 0.0 (1cTc), 2.6 (1cTt), and 4.0 (1tTt) kcal mol–1. A 1tTt → 1cTt → 1cTc isomerization cascade was observed with half-lives (t1/2) in different matrix sites ranging from 30 to 360 h, even though the sequential barriers of 9.7 and 10.4 kcal mol–1 are much too high to be surmounted thermally under cryogenic conditions. A general mathematical model was developed for the complex kinetics of a reaction cascade with species in distinct matrix sites. With this model, a precise, global nonlinear least-squares fit was achieved simultaneously on the temporal profiles of nine IR bands of the 1cTc, 1cTt, and 1tTt rotamers. Classes of both fast (t1/2 = 30–50 h) and slow (t1/2 > 250 h) matrix sites were revealed, with the decay rate of the former in close agreement with first-principles computations for the conformational tunneling rates of the corresponding isolated molecules. Rigorous kinetic and theoretical analyses thus show that a “domino” tunneling mechanism is at work in these oxalic acid transformations. Quantum mechanical tunneling governs the C–O bond rotamerization of simple alkyl and aryl carboxylic acid conformers at cryogenic temperatures. In this study, we report tunneling investigations on a series of electronically different α-ketocarboxylic acids including glyoxylic, pyruvic, cyclopropylglyoxylic, and phenylglyoxylic acid in solid Ar and Ne as host materials at temperatures ranging from 3 to 20 K. The higher-lying rotamers generated through photoirradiation with wavelengths of λ = 313 nm or λ > 850 nm convert to their low-energy conformers through hydrogen-tunneling, as evident from the time evolution of their infrared spectra, and the complete suppression of this process by deuteration. The conversion rates sensitively depend on the choice of matrix material and the tunneling half-lives range from a few hours to several days and are higher in Ne than in Ar for glyoxylic, pyruvic, and cyclopropylglyoxylic acid. The advent of tunneling in α-ketocarboxylic acids dominates their conformational preferences and conceivably also the reactivity of biologically and pharmacologically relevant acid congeners. Tunneling Control of Chemical Reactions: C–H Insertion versus H-Tunneling in tert-Butylhydroxycarbene. David Ley, Dennis Gerbig, and Peter R. Schreiner Chem. Sci. 2013, 4, 677–684. DOI: 10.1039/C2SC21555A. Elusive tert-butylhydroxycarbene was generated in the gas phase via high-vacuum flash pyrolysis of tert-butylglyoxylic acid at 960 °C. The pyrolysis products were subsequently matrix isolated in solid Ar at 11 K and characterized by means of IR spectroscopy. While still being exposed to the harsh pyrolysis conditions, the hydroxycarbene undergoes CH-insertion to dimethylcyclopropanol, as well as a CC-insertion to novel methylbutenol, with activation barriers of 23.8 and 31.0 kcal mol−1, respectively. Once embedded in the cold Ar matrix, the carbene transforms to its isomer pivaldehyde not only by photolysis, but it also cuts through the barrier of 27.3 kcal mol−1 by quantum mechanical tunneling. The temperature independent half-life is measured as 1.7 h; the tunneling pathway was entirely blocked upon O-deuteration. The experimental half-life of tert-butylhydroxycarbene was verified by tunneling computations applying the Wentzel–Kramers–Brillouin formalism on the minimum energy path evaluated at the computationally feasible M06-2X/6-311++G(d,p) level of theory. Our experimental findings are supported by relative energy computations at the CCSD(T)/cc-pVDZ level of theory. Org. Biomol. Chem. 2012, 10, 3781–3790. DOI: 10.1039/c2ob07170c. 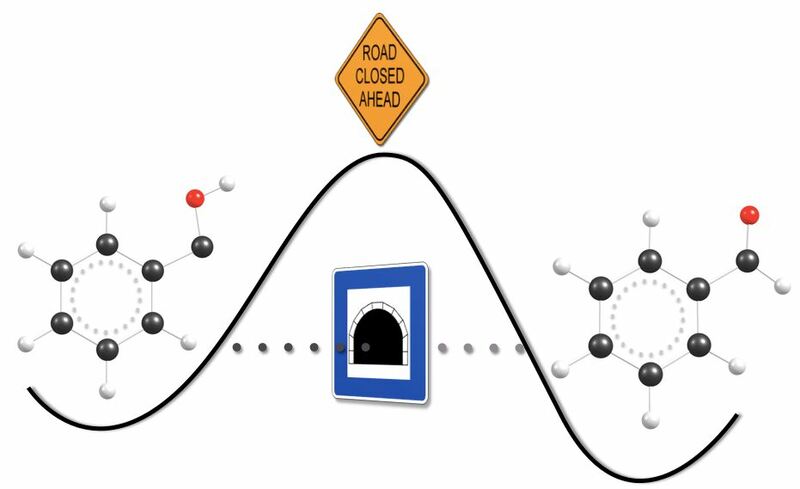 Even though quantum mechanical tunnelling has been appearing recurrently mostly in theoretical studies that emphasize its decisive role for many chemical reactions, it still appears suspicious to most organic chemists. Recent experiments in combination with powerful computational approaches, however, have demonstrated that tunnelling must be included to fully understand chemical reactivity. Here we provide an overview of the importance of tunnelling in organic chemical reactions. Cyclopropylhydroxycarbene was generated by high-vacuum flash pyrolysis of cyclopropylglyoxylic acid at 960 °C. The pyrolysis products were matrix-isolated in solid Ar at 11 K and characterized by means of IR spectroscopy. Upon photolysis, the carbene undergoes ring expansion, thereby paralleling the reactivity of other known cyclopropylcarbenes. The ring expansion product, cyclobut-1-en-1-ol, was characterized for the first time. Matrix-isolated cyclopropylhydroxycarbene undergoes [1,2]H-tunneling through a barrier of approximately 30 kcal·mol–1, yielding cyclopropylcarboxaldehyde. The cyclopropyl moiety acts as a π-donor and increases the half-life by almost a factor of 10 compared to parent hydroxymethylene, resulting in a temperature-independent half-life of τ = 17.8 h at both 11 and 20 K. Hence, cyclopropylhydroxycarbene is the first hydroxycarbene that differs from other members of its family by a significantly prolonged half-life. As expected, the O-deuterated analogue does not show tunneling. Our findings are rationalized by accurate CCSD(T)/cc-pVnZ (n = D, T)//M06-2X/6-311++G(d,p) computations. The half-life of cyclopropylhydroxycarbene was verified by tunneling computations employing the Wentzel–Kramers–Brillouin formalism. By comparison with other experimentally known hydroxycarbenes, we determine the electronic donor capabilities of the carbenes’ substituents to be a dominant factor governing their half-lives. Methylhydroxycarbene: Tunneling Control of a Chemical reaction. Peter R. Schreiner, Hans Peter Reisenauer, David Ley, Dennis Gerbig, Chia-Hua Wu, and Wesley D. Allen Science 2011, 332, 1300–1303. Download Perspective: Taking the high road and getting there before you. Barry K. Carpenter Science 2011, 332, 1269–1270. 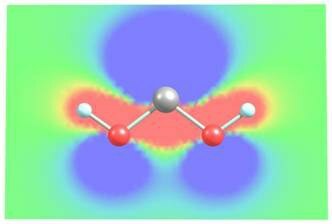 Highlights: a) Quantum tunneling creates “wrong” molecule. Laura Howes Chemistry World 2011, June 10. b) Tunneleffekt wandelt Methylhydroxycarben in Acetaldehyd um. Reto Müller Organic Chemistry Portal 2011, June 14. c) Verblüffender chemischer Tunnelverkehr Scienceticker 2011, June 9. d) Das Beamen von Materie: Neue Triebkraft chemischer Reaktionen entdeckt Chemie.de 2011, June 16. Chemical reactivity is conventionally understood in broad terms of kinetic versus thermodynamic control, wherein the decisive factor is the lowest activation barrier among the various reaction paths or the lowest free energy of the final products, respectively. Here we demonstrate that quantum mechanical tunneling can supersede traditional kinetic control and direct a reaction exclusively to a product whose reaction path has a higher barrier. Specifically, we prepared methylhydroxycarbene (H3C–C–OH) via vacuum pyrolysis of pyruvic acid at ca. 1200 Kelvin (K), followed by argon matrix trapping at 11 K. The previously elusive carbene, characterized by ultraviolet (UV) and infrared (IR) spectroscopy as well as exacting quantum mechanical computations, undergoes a facile [1,2]hydrogen shift to acetaldehyde via tunneling under a barrier of 28.0 kilocalories per mole (kcal mol–1) with a half-life around 1 hour (h). The analogous isomerization to vinyl alcohol has a substantially lower barrier of 22.6 kcal mol–1 but is precluded at low temperature by the greater width of the potential energy profile for tunneling. The principal purpose of this investigation is the determination of the tunneling half-lives of the trans-HCSH → H2CS and the trans-HCSeH → H2CSe unimolecular isomerization reactions at temperatures close to 0 K. To aid these determinations, accurate electronic structure computations were performed, with electron correlation treatments as extensive as CCSDT(Q) and basis sets as large as aug-cc-pCV5Z, for the isomers of [H,H,C,S] and [H,H,C,Se] on their lowest singlet surfaces and for the appropriate transition states yielding structural data for key stationary points characterizing the isomerization reactions. The computational results were subjected to a focal-point analysis (FPA) that yields accurate relative energies with uncertainty estimates. The tunneling half-lives were determined by a simple Eckart-barrier approach and via the more sophisticated though still one-dimensional Wentzel–Kramers–Brillouin (WKB) approximation. Only stationary-point information is needed for the former while an intrinsic reaction path (IRP) is necessary for the latter approach. Both protocols suggest that, unlike for the parent hydroxymethylene (HCOH), at the low temperatures of matrix isolation experiments no tunneling will be observable for the trans-HCSH and trans-HCSeH systems. We investigated both light- and heavy-atom tunneling in the rearrangements of a series of cyclopropylcarbenes using canonical variational transition state theory with multidimensional tunneling corrections (CVT/MT) and the Wentzel-Kramers-Brillouin (WKB) formalism. Halogeno- and hydroxy-substituted cyclopropylcarbenes were found not to undergo carbon tunneling owing to wide reaction barriers. However, while carbon tunneling plays a major role in the ring expansion of parent cyclopropylcarbene yielding cyclobutene, cyclopropylmethylcarbene is prone to undergo hydrogen tunneling to give cyclopropylmethylene. We present the first generation and spectroscopic identification of the higher-lying E-conformer of the simplest aromatic carboxylic acid, benzoic acid (1a) as its O-deuterated isotopologue (E-d1-1a) using matrix isolation techniques; parent E-1a could not be observed owing to fast H-tunneling to more stable Z-1a. Even deuterated E-d1-1a converts quickly back to Z-d1-1a through D-tunneling with a half-life (τ) of ca. 12 min in Ar at 11 K. Tunneling computations using an Eckart barrier in conjunction with a CCSD(T)/cc-pVTZ//MP2/cc-pVDZ + ZPVE intrinsic reaction path reveal that τ of E-1a is only ca. 10–5 min, in marked contrast to simple aliphatic acids that have half-lives in the range of minutes. The electronic substituent effects on D-tunneling in para-substituted benzoic acid derivatives (p-X-PhCOOD, d1-1) were systematically studied in Ar matrices at 11 K. σ-Electron donors (X = alkyl) increase the half lives of d1-1, while σ-acceptor/π-donor groups (X = OD, NH2, Hal) and even more so σ/π-acceptors (X = NO2) decrease τ. The latter finding is in line with the smaller E-to-Z-reaction barriers and narrower reaction widths for the isomerization. Tunneling substituent constants (σt) for this conformational isomerization were derived experimentally and computationally. Phenylhydroxycarbene (1, Ph–C–OH), the parent of all arylhydroxycarbenes, was generated by high vacuum flash pyrolysis of phenylglyoxylic acid (at 600 °C) and spectroscopically (IR, UV/Vis) characterized via immediate matrix isolation in solid Ar at 11 K. The identity of 1 was unequivocally confirmed by precise agreement between observed IR bands and (unscaled) anharmonic vibrational frequencies computed from a CCSD(T)/cc-pVDZ quartic force field. The UV/Vis spectrum of 1 displays a broad band with maximum absorption at 500 ± 25 nm (2.5 ± 0.1 eV) that extends to around 640 nm (1.9 eV), in full accord with combined CCSD(T)/cc-pVQZ and EOM-CCSD/cc-pVTZ computations that yield a gas-phase vertical (adiabatic) excitation energy of 2.7 (1.9) eV. Unlike singlet phenylchlorocarbene, 1 does not undergo photochemical ring expansion. Instead, 1 exhibits quantum mechanical hydrogen tunneling to benzaldehyde underneath a formidable barrier of 28.8 kcal mol–1, even at cryogenic temperatures. The remarkable hydrogen tunneling mechanism is supported by the temperature insensitivity of the observed half-life (2.5 h) and is substantiated by a comparable theoretical half-life (3.3 h) determined from high-level barrier penetration integrals computed along the intrinsic reaction path. As expected, deuteration turns off the tunneling mechanism, so that d-1 is stable under otherwise identical conditions. Abstract. CO2 extrusion from simple α-keto carboxylic acids proofs to be a novel method of general utility for the preparation of hitherto unknown hydroxycarbenes. Dihydroxycarbene as well as methoxyhydroxycarbene, which are both stabilized through π-type out-of-plane as well as in-plane σ-conjugation, can thus be prepared and fully characterized. Abstract. Singlet Carbenes exhibit a divalent carbon atom whose valence shell contains only six electrons, four involved in bonding to two other atoms and the remaining two forming a non-bonding electron pair. These features render singelt carbenes so reactive that they were long considered too short-lived for isolation and direct characterization. This view changed when it was found that attaching the divalent carbon atom to substituents that are bulky and/or able to donate electrons produces carbenes that can be isolated and stored. N-heterocyclic carbenes are such compounds now in wide use, for example as ligands in metathesis catalysis. In contrast, oxygen-donor-substituted carbenes are inherently less stable and have been less studied. The pre-eminent case is hydroxymethylene, H–C–OH although it is the key intermediate in the high-energy chemistry of its tautomer formaldehyde, has been implicated since 1921 in the photocatalytic formation of carbohydrates, and is the parent of alkoxycarbenes that lie at the heart of transition-metal carbene chemistry, all attempts to observe this species or other alkoxycarbenes have failed. However, theoretical considerations indicate that hydroxymethylene sould be isolatable. Here we report the synthesis of hydroxymethylene and its capture by matrix isolation. 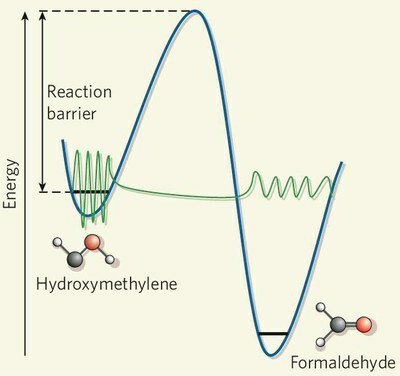 We unexpectedly find that H–C–OH rearranges to formaldehyde with a half-life of only 2 h at 11 K by pure hydrogen tunneling through a large energy barrier in excess of 30 kcal mol–1. Herr Prof. Dr. Günter Cleffmann am 27.3.2019 verstorben.